Since 1923, New Mexico Magazine has served as the voice of the state’s tourism, arts, recreational, and economic-development efforts. We want to tell your stories and get your message most effectively in front of our readers through our range of multimedia offerings. 1. Look ahead. We plan much of the content of the following year’s issues in late summer, and work on details of coverage at least four months ahead of each issue’s publication. The more lead time you give us, the better your chances of getting editorial coverage. Send press releases or pitches to queries@nmmagazine.com. Go.See.Do. We need your hot tips for this guide to the trendy-cool things to check out around the state. Tasting. Tell us about new or undiscovered restaurants, breweries, amazing chefs, well-crafted cookbooks, or other food ideas and trends. Art. Help us cover your art exhibits, artists, festivals, and trends. 4. It’s in the email. Subscribe to our biweekly newsletter, which is packed with great tips on what to see and do around the state as well as offers and tips from our advertisers. 5. Get social. Connect with us on social media and respond to and share our posts on Facebook, Twitter, and Instagram (and tag us, too!). 6. Get us out there. Invite us to visit your community or location and show us all the amazing reasons your town and its people and places are great. 7. Make a social call. Make an appointment to visit us at our offices here in Santa Fe, and fill us in on what’s new and exciting at your attraction, business, or community. 8. Invite us to speak at your event. 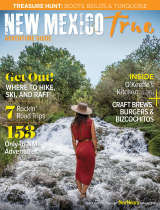 Our staff is eager share the secrets behind getting exposure in New Mexico Magazine. 9. Get to know New Mexico True. Make sure you’re familiar with the marketing tools available to you through our parent agency, the New Mexico Tourism Department. Have a product? Check out the New Mexico True Certified program. Need an advertising boost? Apply for a New Mexico True Co-Op grant. Sign up for the tourism industry enewsletter to keep up with webinars, grant opportunities, and other important information. 10. Advertise. It works. And our advertising consultants will help you create the best mix of print-and-digital packages that can include everything from traditional print and digital space to sponsored content and custom print products.